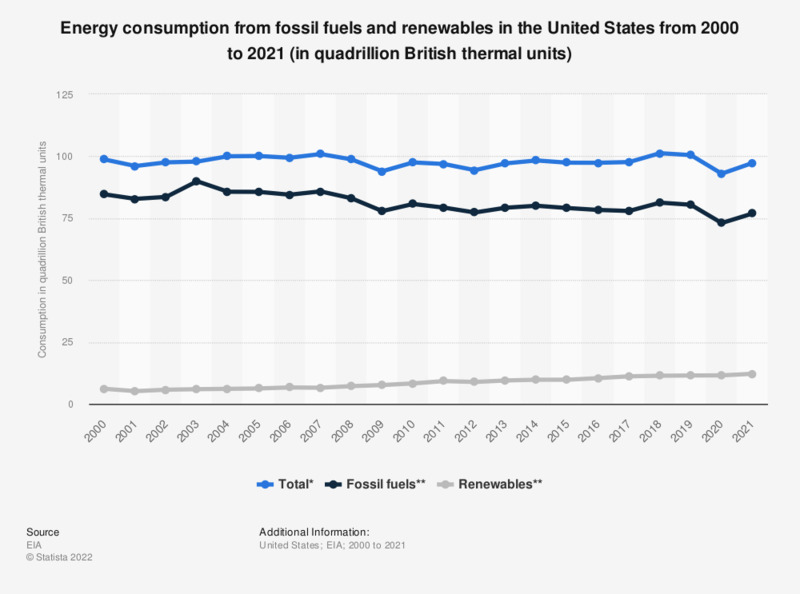 The statistic shows the U.S. energy consumption from fossil fuels and renewables between 2000 and 2018. In 2018, the U.S. consumed approximately 11.5 quadrillion British thermal units of energy derived from renewable sources. * Includes coal coke net imports and electricity net imports, not shown separately. ** Most data are estimates; renewables include conventional hydroelectric power, geothermal, solar, and wind; consumption of electricity from wood, waste, and alcohol fuels; geothermal heat pump and direct use energy; and solar thermal direct use energy. Everything On "Energy consumption in the United States" in One Document: Edited and Divided into Handy Chapters. Including Detailed References.